Polenta, or corn meal, is a staple in northern Italian cooking and has been ever since corn was introduced to the peninsula from the Americas in the sixteenth century. A versatile ingredient in the kitchen, it is cooked in water until it becomes a dense, creamy porridge, then can be eaten as is, often as an accompaniment to stews, sausages, lentils or fish, or it can be cooled and set, then grilled, baked or deep fried (a good way to use leftover soft polenta) to be served with various toppings. Uncooked polenta is also a wonderful alternative to regular wheat flour in cakes and biscuits, making it a good gluten-free option. Polenta generally comes in three different types: Bramata, which is a coarse grain, good for making a firmer polenta, fioretto, a finer grind for or a creamier, soft polenta or for baking cakes or biscuits. There's also instant polenta, which is partially cooked then dried again and takes just minutes to prepare. But what you make up for in time, you'll lose in flavour – save this just for those times when you quickly want to make a polenta that you will then grill, bake or deep fry. I've also found that it's a good substitute for the fioretto for use in baking. 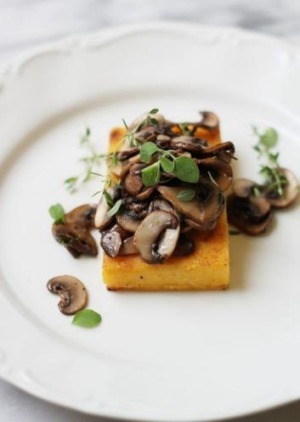 For a soft, creamy polenta, such as in the recipe below with sausage and mushroom ragu, you will want to use proper, finely ground polenta and long, slow cooking for the best results. To prepare polenta for making crostini, use a slightly higher ratio of polenta to water than you would for a soft polenta and use a coarse-ground meal such as bramata. Alternatively, this is also a great way to use up any softer polenta. But be aware that a softer set polenta will be a little more delicate and the resulting crostini will be best baked or deep fried rather than grilled. To prepare the polenta crostini, cook the polenta with the water and salt in a large non-stick saucepan over gentle heat for about 30-40 minutes to create a dense, thick polenta. Use a wooden spoon to stir often – it may help to have another set of hands to take over when your arms get tired. If the polenta starts making big bubbles turn the heat down to the minimum or remove it from the heat for a minute. When cooked, remove from the heat and transfer the polenta to a large casserole dish or baking tray greased with olive oil. Quickly (as it sets fast), press the polenta down with a silicon spatula, or if it's not too hot, with your hands, spreading it out as you go, until it is about 2cm thick and relatively smooth on top. Let cool completely. Once set, cut the polenta into rectangular slices about 7x5 cm. Place them on a baking tray lined with baking paper and bake at 200ºC until they are golden and crisp on the outside, about 20 minutes. Alternatively, you can brush them with a bit of olive oil and then grill or barbecue them until golden. 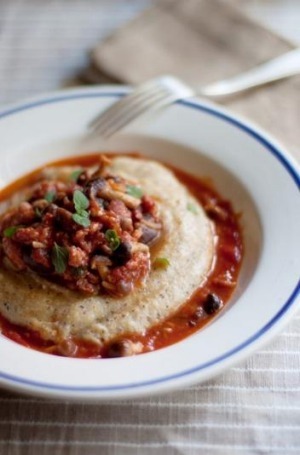 A perfectly smooth, creamy and soft polenta is a great accompaniment to your favourite ragu. This polenta recipe is inspired by a typical dish of the Valtellina valley, not far from Lake Como in Italy's north. Known as polenta taragna, it's made with a mixture of buckwheat flour and corn meal for a rustic and earthy polenta that goes particularly well with sausages. Despite it's name, buckwheat, which is what lends this polenta its flecked appearance, is not actually a wheat but a seed and is gluten-free. You could also make this with 100 per cent polenta if you prefer. Wild mushrooms or a mixture of different mushrooms make this ragu interesting but you can also use regular button mushrooms. For the polenta: Heat a large, deep pot with the water and when boiling, add the salt and pour the buckwheat and polenta flours in a steady stream into the water. Stir constantly while simmering over low heat for about 45 minutes (or up to 60 minutes) or until thick and creamy but still fluid and cooked (taste it, it should not feel grainy in your mouth). Stir the butter through until melted. For the ragu: Finely chop the onion, celery and garlic and gently saute in the olive oil a wide pan over a low heat until translucent and golden. Crumble the sausage into small pieces and add to the pan, turning until browned on all sides. Add the mushrooms, roughly chopped. Pour in the tomatoes, breaking them up with your spoon while they are in the pan, and allow the sauce to simmer and reduce slightly to a thick sauce, cooking slowly for at least 30 minutes. Season with salt and pepper to taste. Add the herbs. . Serve the ragu spooned over a bowl of the soft polenta with some shaved or grated Parmesan cheese. A cake of perfect proportions, the pound cake usually calls for equal amounts of its main ingredients: flour, sugar, eggs and butter. Here, I've substituted the flour for polenta and almond meal, making this a gluten-free cake, and I've used a little less sugar and butter. 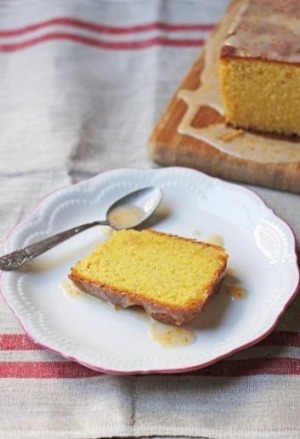 The result is a simple cake, incredibly moist, with the sunny, golden colour of polenta. 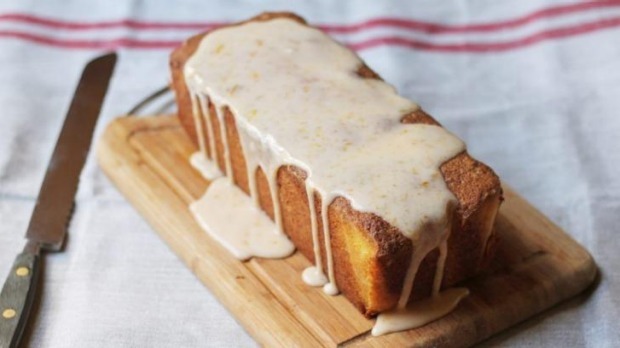 It keeps well for a week, never going dry (actually, it's perhaps even better when it's a few days old) and is quite nice plain or with a very thin glaze of icing over the top, made with icing sugar and the juice of 1 orange. If using whole blanched almonds, pulse them in a food processor until reduced to a fine, crumbly meal. Cream the butter and sugar together, then add eggs one by one, beating very well until you have a smooth batter. Fold in the almonds, the polenta and orange zest. Pour the mixture into a loaf tin lined with baking paper (or greased and dusted with polenta) and bake at 180C for 1 hour or until golden brown on top and springy. If desired, top with a glaze made of about 100g of icing sugar and a few tablespoons of freshly squeezed orange juice, combined until smooth.